Not as good as the first one, but a pretty funny and interesting prequel that shows the boys in college participating in fraternity competitions. 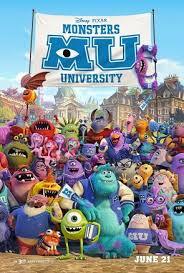 Monsters University is definitely good entertaining fun, but it’s nothing close to the first film. that’s because the first movie, monsters inc, was completely fresh and creative. it invented a whole other world filled with great rules and ideas. monsters university doesn’t really do any of that. instead, it becomes it’s own thing, which means a somewhat formulaic story about fraternity competitions. still, the scenes and events they participate in turn out to be fun and clever, and the movie has a number of surprise endings. the second half far exceeds the first half of the film, as this movie is determined to not be predictable or end in a usual way. i really admire that about this film. it isn’t great, but it’s defintely enjoyable. 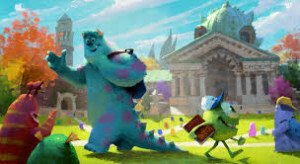 Monsters University has the initial premise of a direct to video movie, yet it ends up being so much more. That premise is simply, “lets see the two main characters from Monsters Inc when they were just teenagers who first got to college.” It’s like all of those sequels and prequels they made to Aladdin, or any one of the nineties Disney films (The Little Mermaid, beauty and the beast.) only Pixar does it’s sequels a little differently then Disney animated films used to. With Pixar, a sequel or prequel gets the royal treatment no matter what. That means getting the original cast back, developing the story into something pretty smart, and rolling it out for a theatrical release. It’s what they did for the two sequels to toy story, the sequel to cars, and now this sequel to monsters inc.
It’s a good thing too, because monsters university happens to be a very entertaining movie. It’s the first real prequel that has ever been made to a pixar film, and maybe to a cg animated film all together (i don’t think dreamworks films shrek or kung fu panda have any prequels out yet). with that in mind, the movie really does find creative and elaborate ways to explain how things came to be. this might not amount to much in the end, as the movie turns into the usual formulaic competetition film, but it still helps move us along during the course of the film. monsters university wants to put the pieces in motion so that at the end of this film, we are all caught up one the events that would lead to the original film, mosters inc, happening. that means seeing the time when mike and sully met for the very first time, seeing how they got involved with monsters inc and collecting screams, and watching how they went from being enemies to being friends. the movie begins with a flashback to a very young mike wasowski (billy crystal). we see him on a field trip and how he is the kid who the others don’t really like. he’s the guy who never has a buddy or partner for trips and who ends up being partners with the teacher over and over again. the class tours the monsters inc factory and there are a couple of cool nods to the original film, such as the slow motion walk of the scarers played to the same music as their walk in the first film. mike ends up sneaking onto the scare floor, then jumping into one of the doors while a scarer is in there, and watching the creature work. when he gets out, the monster is impressed that he never heard mike, while they were inside the human world. maybe this kid has what it takes. the next thing you know, mike is heading to monsters university. if the first monsters movie was sully’s film more than anyone else’s (he’s the one who had a relationship with boo), then this second movie is more mike’s than sully’s. the opening flashback is enough to prove it. so is the fact that we meet randal (steve buscemi), another familiar face from the first film, before we even meet sully here. randal was a great villain in monsters inc, and here he plays mike’s roomate. this movie, like x-men first class, sets up how a villain might start out as a regular guy, but go through such a change that by the end of the film, he is an absolute bad guy. the first time we meet sully is in a scaring class, when we learn of his family history and how he has a legacy to live up to. sully knows he’s great at all this, and doesn’t think he really has to work at it. he doesn’t even bring a pencil to school on the first day. mike, on the other hand, is a brainiac, studyaholic. he’s the exact opposite of sully, and then first time they meet, sully hops into mike’s room through an open window, while chasing after a pig for a fraternity prank. mike gets involved, mainly because he wants sully out of there, fast, and soon the two of them are chasing after the pig through the campus quad. it ends up being a pretty cool chase scene. this is all just introduction material, of course. the real story begins when mike and sully are enemies, joining opposing fraternities, and end up having a fight. their fight takes place in the middle of class, and causes them to knock over something valuable and irreplaceable of the head deans. now they are both in trouble, and face being kicked out of the school. only mike has an idea. he challenges the dean to let him enter the scare games (made to sound like the hunger games on purpose, i beliee.) if he and his team win the scare games competition, then she has to reenstate him back into the scare program. but if he loses, then he is kicked out of school. the dean agrees, and sully, who has now been kicked out of his own fraternity, joins up with mike’s squad. the first half of the movie is all about getting to this point. it’s all setup, including character introductions, college life intros, and how these two went from being enemies to being on the same side. the second half is where the competition really starts (another similarity to the hunger games.) mike and sully join with the fraternit of nerds and outcasts, which is a cliche if ever there was one. i suppose it’s okay here, because after all, this is a comedy for kids that is kind of spoofing the usual formula. but compared to the original film, where everything was fresh and creative, this storyline is kind of a letdown. The ideas for the different events of the competition are definitely pretty neat. the first one is a situation where the team members have to race through a pitch black tunnel area with glow in the dark land mine-like spikes all over the place. if you bump into one, you blow up in whatever spot it touched you. and to make matters even worse, there are lots of audiences members, watching from above, who are throwing these spikes down at you. the characters all get hit, and swell up, and it ends up being pretty funny. another cool event is the libary scene where the mission is to get a flag without disturbing or getting captured by the libarian. this libarian might look like a little old lady, but she turns out to be a huge beast. and the guys find a clever way to work together in order to get past her. they certainly can’t keep quiet enough to go undetected by her, but once they start getting noticed, they each help the others out by distracting her. it turns out to be another fun scene. the movie has a couple of very interesting endings up ahead of it. the second half of the movie really works the best, going all the way to through these endings. i like the way that the first ending of them film, which feels very cliched and ridiculous, ends up getting a great explanation for how and why it happened. and then there is a follow up ending that is even better. none of this is predictable at all. the guys do some things that i’m surprised disney and pixar are okay with having their main characters do, such as break into a factory and get chased by the police. even still, i would prefer this any day to a usual cliched ending. the movie is definitely unpredictable. it isn’t nearly as good as the original film, simply because it takes on a formulaic story, whereas the first film was completely its own thing, oozing with creativity. there are definitely things missing from this film, that the first one had, including real villains and a conspriracy plot. but i’m kind of glad this movie didn’t have those things, because then it would have been a carbon copy of the first film (like the hangover II was to the hangover.) instead, monsters university is very different from the first film in terms of its story, and happens to be a very entertaining film on its own.